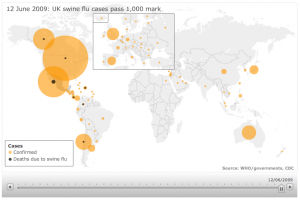 As cases of the, now pandemic, swine flu breach 1,000 in the UK, the BBC has run a great dynamic infographic to show the spread of cases globally. The animation is run using the slider along the bottom, showing both the increase in cases of the flu and the related deaths – in the light and dark circles respectively. Thankfully at this time the death figures are still low, and we can only hope that the preparedness plans in place around the world will keep it that way, but still the BBC graphic is a wonderfully simple yet effective illustration. Google, Yahoo and Adobe have just announced that they have worked together to enable search results to crawl not only HTML, but also Flash files. Interesting news indeed. For years now web builders have had to build two sites in parallel if they use Flash – one for the users, and one for the search engines that preferred eating text in HTML form. Now this raises a few interesting questions. First up, what will happen to the search results while Google and Yahoo work out how to rank and rate Flash content? No Flash designer has ever had to consider the SEO effects of their Flash coding so surely there must be some pretty badly constructed Flash content out there, at least in terms of what Google is used to seeing. Secondly, are we really excited to see lots of Flash enabled intros for boring, company sites showing up when we search? Probably not – that’s why ‘skip intro’ will soon be the most hated, yet competitive term on Google. Finally, now that Flash folk won’t have to create HTML versions of their sites for SEO purposes – will they still remember to do so for partially sighted visitors? Text to speech browsers are not highly optimized for reading Flash, and although in the UK this audience is supported by legislation this is not the case globally. Perhaps Adobe will also release their Flash ‘search reading’ software to other companies that make text to speech browsers to help them out there – unless Google just offers it as an API of course. Click here to Skip intro.